“This is from the Michael Mann piece you linked to. As can be seen isostatic adjustment makes a considerable difference to actual sea levels experienced at the time, so it is worth looking at the many other studies of the region and period which gives some additional data. Citation 1b) This study (inexplicably misquoted by Science Daily a few months ago) covers numerous studies in the same area. 1d) there are many studies of sea level in this period and much physical evidence such as sea castles stranded as levels dropped following their construction. 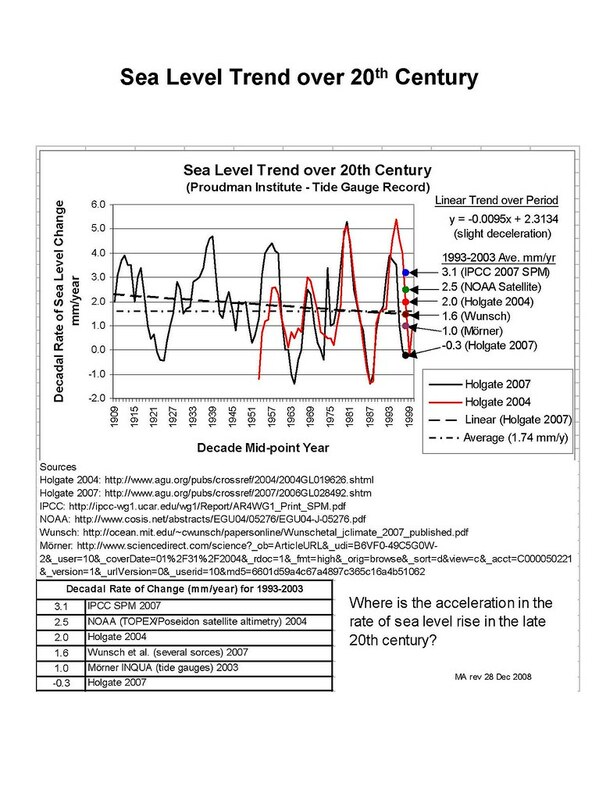 Citation 3b) According to S. J. Holgate, a recognised world authority in geophysical research at the UK-based Proudman Oceanographic Laboratory in Liverpool, in his paper published in 2007, the following results represent the most comprehensive measurements of decadal sea-level change rates during the 20th century. Between 1904 and 1953 global sea levels rose by 2.03 mm per year, whereas from 1954 to 2003 they rose by only 1.45 mm per year, giving an annual mean rate of 1.74 mm per year over the 100 years to 2003, or seven inches per century. Importantly, there was no increase in the rate of change over the whole century. This is graphically illustrated here.